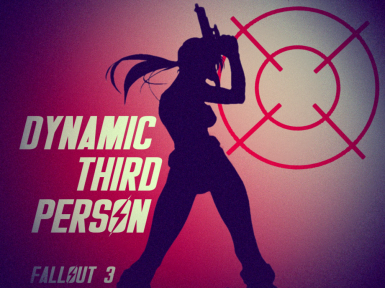 Fully customizable, modular mod that greatly increases the range of the third-person camera capabilities. Features stance-dependant camera positions, auto-adjusting offsets to preserve your crosshair's functionality, and more! Changed the behaviour of the menu item so that it doesn't cause CTD's under certain specific conditions. The inventory item is now flagged as a quest item and as such it can no longer be stored in a container. 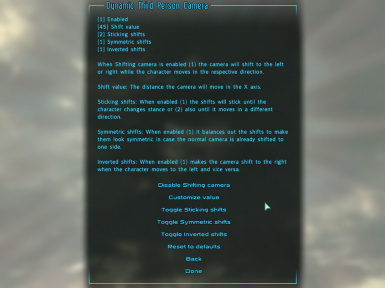 Moved the description of the configuration options of the Shifting camera sub-menu to a note for those not using DarnifiedUI. Now the inventory item will automatically return to the player's inventory when it's dropped to the ground. It can still be placed in a container. 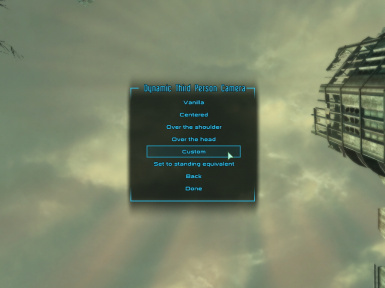 Added compatibility with some alternative-start mods that remove the menu item. Increased the menus capabilities even further. Implemented a feature to allow for highly customizable camera shifts to the sides. 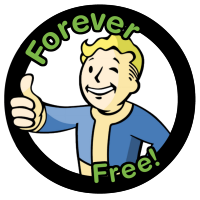 Implemented a version check to prevent problems when installing a new version without uninstalling the old one first. Modified the menus for improved snazziness and added features. 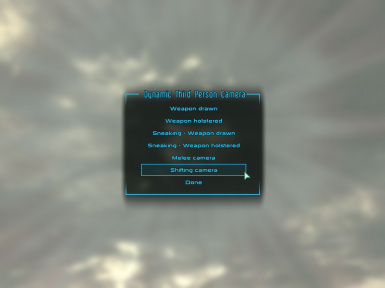 Implemented the ability to set two extra fully customizable camera positions for when the player is sneaking. 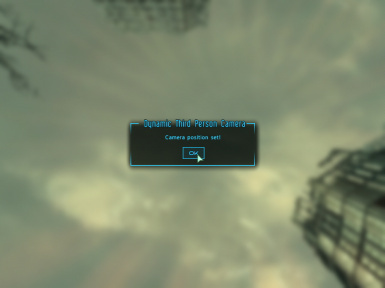 Fixed an offset discrepancy that happened when the Centered preset was selected before trying to customize the camera position. 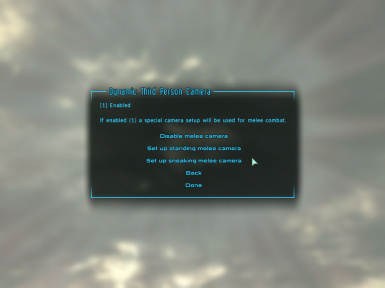 The camera settings now re-apply automatically when the savegame is loaded and when the camera settings are changed. 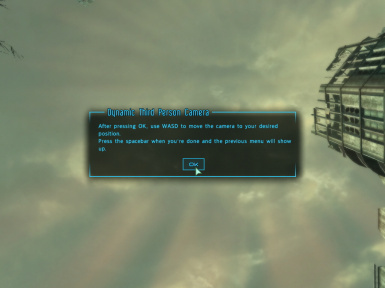 As of version 3 includes a special fully customizable Shifting camera feature to make the camera slide to the right or left as the character moves in those directions. Just drop the esp in your Data folder and activate it with a mod manager of your choice. The menu itself is pretty self-explanatory, but a note detailing the configuration options is also added upon install. The following video briefly showcases the version 2.